Why Asset Management is so important for Vulnerability Management and Infrastructure Security? When people ask me how should they start building Vulnerability Management process in their organization (well, sometimes it happens), I advice them to create an effective Asset Management process first. Because it’s the foundation of the whole Infrastructure Security. The term “Asset Management” has different meanings and if you start to google it, you will get some results related mainly to finance sphere. I use this term as Qualys and Tenable. For me Asset Management is the process of dealing with network hosts. 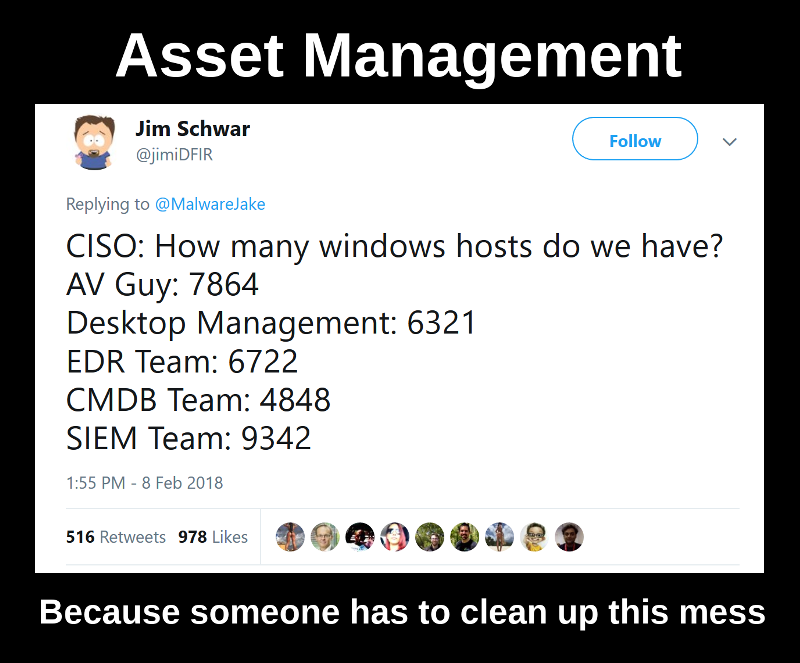 So, what should you do in situation described in the tweet above, when you don’t know exactly how many Windows hosts you have in your corporate IT environment? And, more importantly, why do you need to know? This entry was posted in Asset Management, Vulnerability Management and tagged Agents, antivirus, CISO, CMDB, desktop, EDR, endpoint, LDAP, monitoring, SIEM, Splunk, Windows on April 15, 2019 by Alexander Leonov. Can a Vulnerability Scan break servers and services? 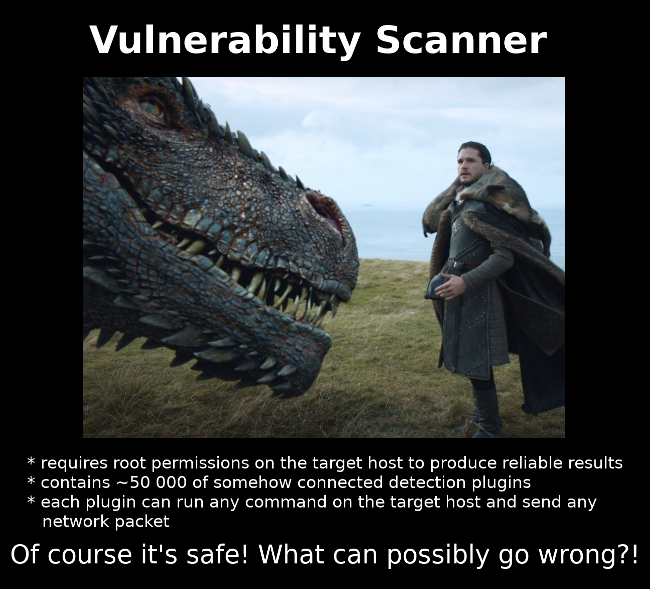 The most serious problem of Vulnerability Scanners is that they are too complex and unpredictable. Usually they don’t affect the target hosts, but when they do, welcome to hell! And if you scan huge infrastructure, tens thousands hosts and more, it’s not “if” the scanner will break the server it’s “when” it will do it. As a responsible person for Vulnerability Management you will be also responsible for all the troubles that VM product can make in the IT infrastructure. And what will you say to the angry mob of your colleagues from IT and Business when they will be quite curious to know why did the service/server go down after the scan? Actually, it’s not much to say. 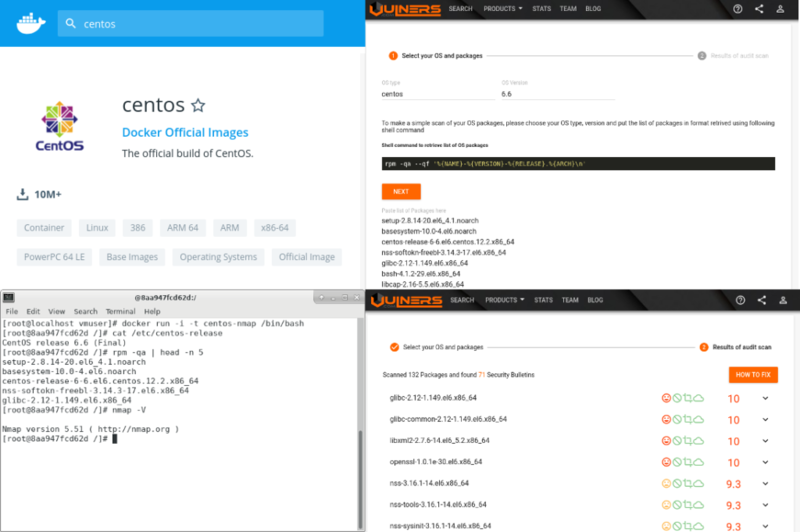 This entry was posted in Vulnerability Management and tagged detection, Linux, scan, vulners, Vulners Audit, vulners.com on April 4, 2019 by Alexander Leonov. But it seems that Docker will be here for a long time, so we will have to live with it. 😉 Here I will not write what Docker is and how it works. There are many publications about this. I personally interested in what actually we can do with these weird “virtual machines”, how can we run and assess them. This entry was posted in Concept, Virtualization, Vulnerability Management and tagged Alpine, CentOS, docker, Kubernetes, Nmap, rpm, vulners, Vulners Audit, vulners.com on March 11, 2019 by Alexander Leonov. 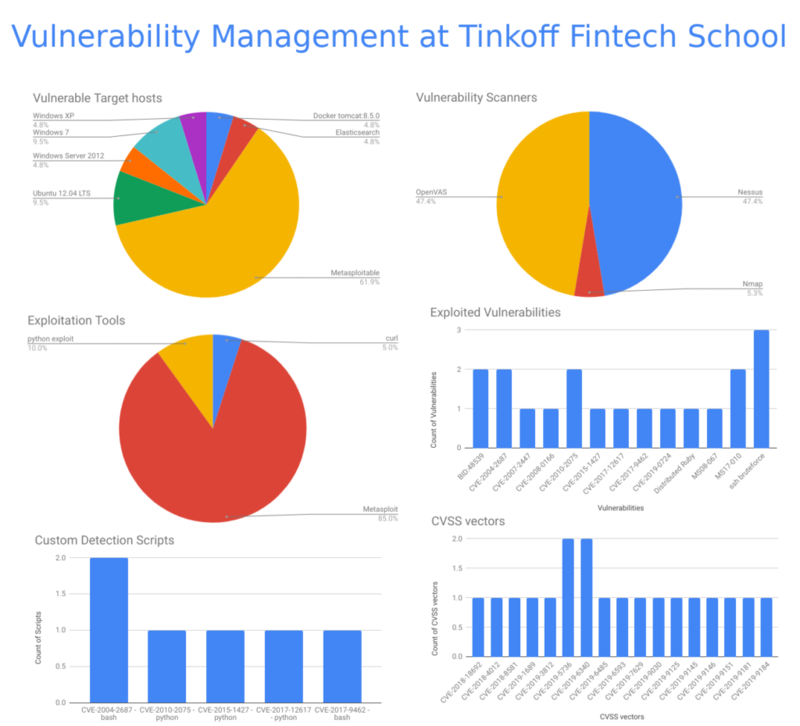 In the last three weeks, I participated in Tinkoff Fintech School – educational program for university students. Together with my colleagues, we prepared a three-month practical Information Security course: 1 lecture per week with tests and home tasks. Each lecture is given by a member of our security team, specialized in one of the following modules: Vulnerability Management, Application Security, Infrastructure Security, Network Security, Virtualization Security, Banking Systems Security, Blue & Red-teaming, etc. The course is still ongoing, but my Vulnerability Management module is over. Therefore, I want to share my impressions and some statistics. This entry was posted in Events, Vulnerability Management and tagged Apache Tomcat, curl, CVE, CVSS, DistCC, docker, EternalBlue, Exchange, homework, lecture, Linux, Metasploit, Metasploitable, Nessus, NVD, OpenVAS, Samba, SSH, test, vsftpd, Windows on March 4, 2019 by Alexander Leonov. In the comments of the previous post about Tenable IO WAS Fergus Cooney mentioned a new Google Chrome extension for Tenable IO WAS, that should help in configuring scan Authentication setting. You can install it in Chrome Web Store. The idea is great. Authentication process in modern web applications is actually too complicated for Web Application Scanners. It is almost impossible to determine automatically which elements of the web interface should be clicked and where to enter the login and password. So it’s great that we can help scanner to do this with the Selenium script. And if Selenium IDE is somehow integrated into the scanner, it is even better. 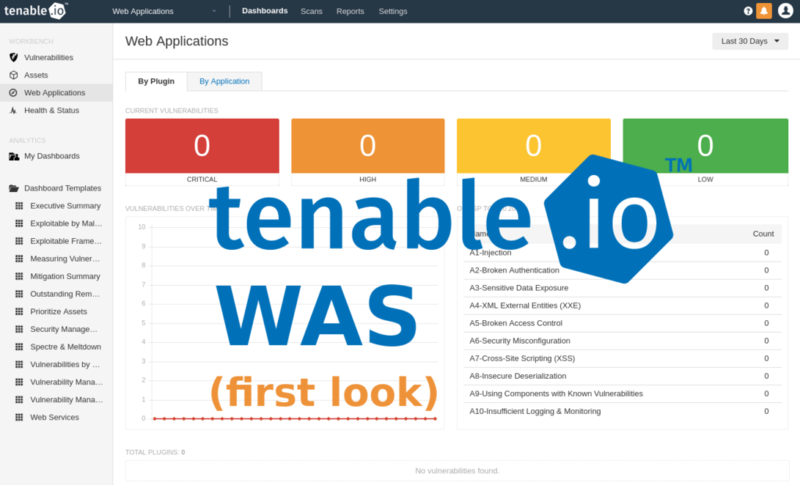 With Tenable.io Web Application Scanning Chrome extension you simply perform the authentication procedure in Chrome once manually, and the recorded script will be sent to Tenable IO WAS. However, the actual implementation of this extension, IMHO, could be better. This entry was posted in Web Application Scanner and tagged Google Chrome, Selenium, Selenium IDE, Tenable, Tenable.io, Tenable.io WAS on February 28, 2019 by Alexander Leonov. I’ve spent several weekends on making some code that takes vulnerability description and other related formalized data to “separate the wheat from the chaff”. And what I get doesn’t look like some universal solution at all. Pretty frustrating, but still an interesting experience and great protection from being charmed by trendy and shiny “predictive prioritization”. that the links to related objects (read: exploits) can be actually used for prioritization. Let’s start from the vulnerability description. 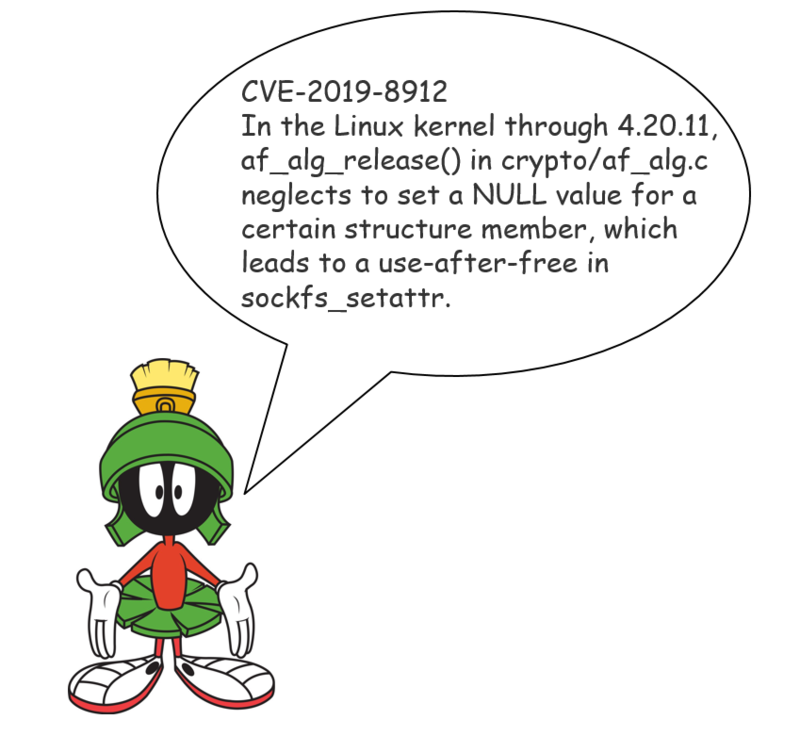 Great example is the last week critical Linux kernel vulnerability CVE-2019-8912. This entry was posted in Vulnerability Database, Vulnerability Management and tagged CNA, crypto, CVE, CWE, exploit, Linux, Linux Kernel, Mitre, NVD, ozlabs, Securityfocus, sockets on February 25, 2019 by Alexander Leonov. That’s why Nessus couldn’t be called fully functioning Web Application Scanning solution. However, Tenable.io WAS is a completely new story. The full description is available on official site. Here I will make a very fast review and give some comments. This entry was posted in Web Application Scanner and tagged Crawl, Nessus, Selenium, Tenable.io, Tenable.io WAS on February 20, 2019 by Alexander Leonov. David Woodcock on Why Asset Management is so important for Vulnerability Management and Infrastructure Security? Why Asset Management is so important for Vulnerability Management and Infrastructure Security? | Alexander V. Leonov on Can a Vulnerability Scan break servers and services? This is my personal blog. The opinions expressed here are my own and not of my employer. All product names, logos, and brands are property of their respective owners. All company, product and service names used here for identification purposes only. Use of these names, logos, and brands does not imply endorsement. You can freely use materials of this site, but it would be nice if you place a link on https://avleonov.com and send message about it at me@avleonov.com or contact me any other way.